If you like to feel a little bit like a police box then how about wearing this Tardis Door T-Shirt Dress. Doctor Who fans will like a fun outfit that says the world that they are true Doctor Who fans. 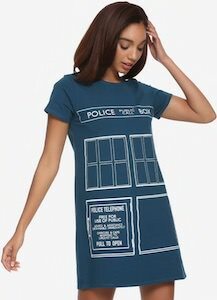 The t-shirt dress is Tardis blue and looks like a long dress and the whole front look like the front door of the Tardis complete with the top and door signs and the windows. The back of the dress is empty with the exception of a small Doctor Who logo. You can get this Doctor Who dress in women’s junior sizes XSmall – 3XL and comes in plus sizes too. If you like art nouveau and Doctor Who then this Tardis dress is what you want to see. The women’s dress is available in sizes XSmall – 3XL and is just a perfect dress for summer and with a jacket perfect for the rest of the year too. The dress is covered in images of the Tardis and they are placed really close together and that makes the design so special and fun. With its shorts sleeves, the Doctor Who dress is just perfect and I am sure that it would look stunning on you so don’t wait too long before you order one. 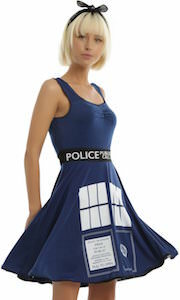 Now there is a skater dress for women that would like the Tardis on their clothes. This Doctor Who dress has a pattern of the Tardis that just tumbles around and the Tardis can be found on the dress so many times that it even tumbles on top of it self. 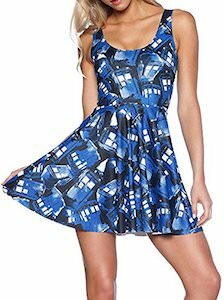 Your new fun dress is ready for you and just images how cool it will look on you and how jealous other Doctor Who fans will be when they see this sleeveless dress on you. Don’t wait, this Doctor Who dress is just perfect for you. If you would like to look like the 11th Doctor only then in a dress then this costume dress is what you need. You can get this Doctor Who dress in sizes XSmall – 3XL and it will be amazing as a costume for Halloween or cosplay or just as an everyday dress. The Doctor Who dress looks like something the 11th Doctor would wear. The skirt part is black and the sleeveless top looks like the jacket the Doctor wears complete with a bow tie on top. And yes there is a pocket for your Sonic Screwdriver as that one has to be handy no matter what. This Tardis dress is something every Doctor Who fan needs. The Tardis blue skater style dress has no sleeves and around the arms and sweetheart neckline, you can see some black crochet details. The waistband is black and says “Police Public Call Box” on it just like on the Tardis and below that you can find the doors of the Tardis with the windows and signs. You can get this Tardis dress in women’s junior sizes XSmall – 3XL and it makes for the perfect dress for any day of the year and it works well as a cosplay or Halloween costume too. Now you can have a Doctor Who dress you won’t likely find in any store as it is just too special for that. The women’s dress is sleeveless and white but the white is covered by gears in the background and a cool painted Tardis on top of that. And you will find the same image on both the front and the back of this Doctor Who dress. You can get this women’s dress in sizes XSmall – 2XL and I am sure that true fans of the Doctor are going to be amazed when they see you wear this unique piece of fan gear. This Halloween you can be a Dalek thanks to this women’s Dalek costume. 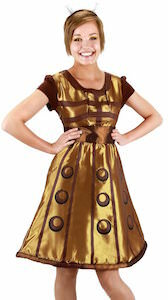 The costume is a nice dress that has a golden color and all the details you expect from a Dalek. And the skirt of the dress of course looks nice a wide so that it looks like you have the footprint of a Dalek. Just pick a size and start exterminating everything in sight. Cosplay or Halloween this dress will make you fit in with the Doctor Who fans. This Tardis dress looks like the Tardis is going down in a swamp. Doctor Who fans that would like something really unique and special should check out this dress. The short sleeve dress is a t-shirt style dress which makes it as comfy to wear as a t-shirt but then just a little bit longer. The dress is black with the front being covered in the image of the Tardis standing crooked in a swamp and the whole color seems a bit green but that is because of the swamp of course. You can get this Doctor Who dress in women’s sizes XSmall – 2XL. Now there is a Doctor Who dress that shows what Daleks think of robots. On this black t-shirt style dress you can find a Dalek that is standing in a heap of robot parts and to me that means that it was busy exterminating them. Of course the Dalek won as there never seem to be many other robots that try to attack the Doctor (besides Cybermen of course). You can get this black Dalek dress in women’s sizes XSmall – 2XL and it has a loose fit just like your favorite t-shirt and if you would like this better as a shirt then that is available to. This Doctor Who dress shows the 12th Doctor on the front. The black dress is a t-shirt style dress with on the front an amazing image of the Doctor. You can see that the whole front is filled with the 12th Doctor and he seems to be thinking up something and he is wearing his Sonic sunglasses. The Doctor Who dress is available in women’s sizes XSmall – 2XL. A dress like this is great for summer as it has a loose fit but of course can be worn in winter to.